I know France gets a special book with every Diamond Edition but I do not count these here. Links are to local shops (Amazon, etc.). Last edited by Jäger-Rose on Tue May 29, 2012 2:51 pm, edited 3 times in total. Why do you not count the books that come with every Diamond Edition in France? And where can I learn more about those? And the UK always gets such books, too? I know Sleeping Beauty got a book with the last Platinum Edition, is that the same thing? @kylemj: Thanks, I've added it to the list. @Disney Duster: I'm actually not sure if they come out frequently but here are two I was able to find for you at once: Lady and the Tramp 1+2 & Bambi 1+2. As you see they look completely different and were no where else released than France. So I don't consider them as part of this "collection series". Oh, those look nice but are really not...when I was in France two weeks ago I saw these and they looked really flimsy...they also had one for the lion king trilogy. Didn't buy them though. I did always like the Jungle book and 101 Dalmatians and Pinocchio ones, but since I have these in several editions, I didn't buy them. Maybe if the entire Platinum line had a release like that I would have. I do admit I'm intrigued by the Alice In Wonderland and Sword In The Stone Collector's Set....but to me, I don't think they're worth what they're going for on Ebay. I really like the Sword in the Stone one, it came with lithographs and some other nice things to look at. Could you tell us more about the Pinocchio, Alice and Sword sets? 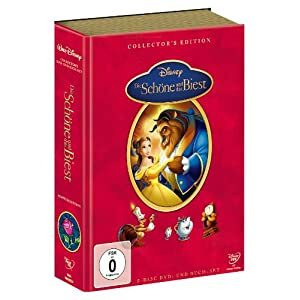 I have the books that came with the US DVD releases for "Lion King," "Aladdin," and "Cinderella," as well as the US Blu-ray releases for "Beauty and the Beast" and "Snow White." I love the books, and would love to pick up more like them for other Disney films. Snow White and BatB got them in the US. Those were included in this gift sets with a Senitype film frame, right? I remember the DVD's coming with the film frame, but not the Blu-rays. I also remember the DVD's coming with cards that had sketches of the various characters, but again, not the Blu-rays. Snow White got a DVD/Book release in the UK both as a Platinum and later as a Diamond edition. Also, Pinocchio got the book treatment in Spain.